2015 Suzuki Celerio 1.4 SZ4 AGS UK review | What Car? Automatic city cars are a tricky proposition. The stop-start nature of city driving means that poor automatic transmissions with jerky shifts can make journeys through traffic even more tiresome. However, the Hyundai i10 has shown that it is possible to make it work. The Suzuki Celerio is now entering the small automatic market with the manufacturer's newly developed Auto Gear Shift (AGS) transmission which has been added to the range, paired to the familiar 67bhp 1.0-litre petrol engine. The Celerio's five-speed auto costs £800 more than the manual equivalent and comes only with range-topping SZ4 trim so, at £9799, this Celerio is the most expensive one you can buy. What is the 2015 Suzuki Celerio 1.0 SZ4 AGS like to drive? The Celerio is well-suited to the city. Its boxy dimensions make it easily manoeuvrable in and out of traffic or into tight parking spaces with corners that are easy to judge. Visibility is great, too, with a nice high driving position with a good view of the road ahead and nice big door mirrors. However, the new auto gearbox is disappointing. It's nippy enough off the mark, but the gearchanges are jerky and unpredictable, and you need to adapt your driving style to make it drive smoothly. Lifting off the accelerator for some of the changes helps to smooth out the ride slightly, but largely the changes are slow; there's a delay in power delivery so it all comes rushing through a beat later than you're expecting. It’s also quite eager to hold onto the gear all the way to the red line, and the screeching engine noise you get in return lets you know it’s being worked too hard. The option of manual changes eradicates the car’s tendency to take the ratios to the limit, but it doesn’t help the slow speed of the shifts. When you plant your foot down, the time it takes the engine to shift down a gear or two makes the car lose momentum, so when the engine engages again and the power is delivered in one big hit it sends you lurching forwards. 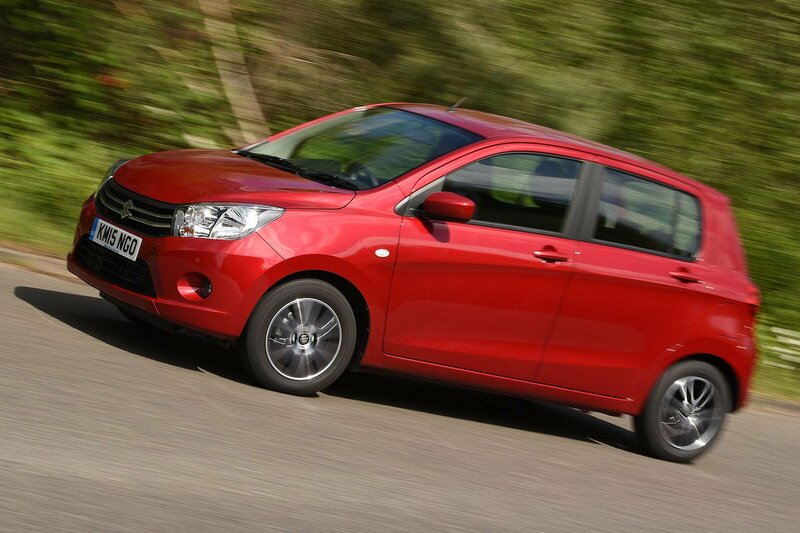 However, the automatic transmission doesn't negatively impact the fuel efficiency of the Celerio. Even with this auto 'box the city car still emits just 99g/km of CO2 emissions and has a claimed fuel economy of 65.7mpg, which betters the i10's 142g/km and 45.6mpg figures. What is the 2015 Suzuki Celerio 1.0 SZ4 AGS like inside? As disappointing as the gearbox is, the interior goes some way to make up for it. Standard equipment in entry-level SZ3 is very generous, and upping the level to SZ4 adds subtle upgrades such as electric rear windows, upgraded alloys and electrically adjustable door mirrors. The layout of the dash makes it simple to operate the different functions, and the soft-touch plastics are of pleasing quality. However, considering SZ3 already comes with air-con, DAB radio, USB, Bluetooth and 14in alloys, it begs the question of whether those minor upgrades are worth the £1000 premium. The answer is probably no. That said, if you need the automatic gearbox, then your only choice of trim is this range-topper. It's spacious inside, with plenty of room up front and just about enough in the back to accommodate two adults. Its boot is fractionally bigger than both the i10 and Volkswagen Up, too. The automatic gearbox is poor, so we would urge you to save £800 and stick with the manual unless you absolutely must have an auto. Likewise, aside from the subtle cosmetic upgrades, SZ4 trim seems a tad excessive considering the steep price increase from the already generous SZ3. It's affordable and comparatively spacious, and few small automatic cars can come close to its fuel efficiency. However, if you’re desperate for a small automatic, you’re ultimately better off forking out a further £800 for the Hyundai i10.